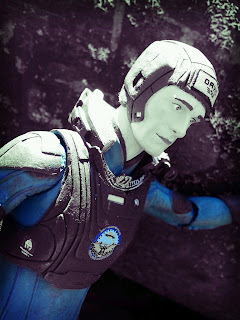 The Epic Review: Action Figure Review: David 8 from NECA's Prometheus (Confirmed Great and a 1/2). Action Figure Review: David 8 from NECA's Prometheus (Confirmed Great and a 1/2). 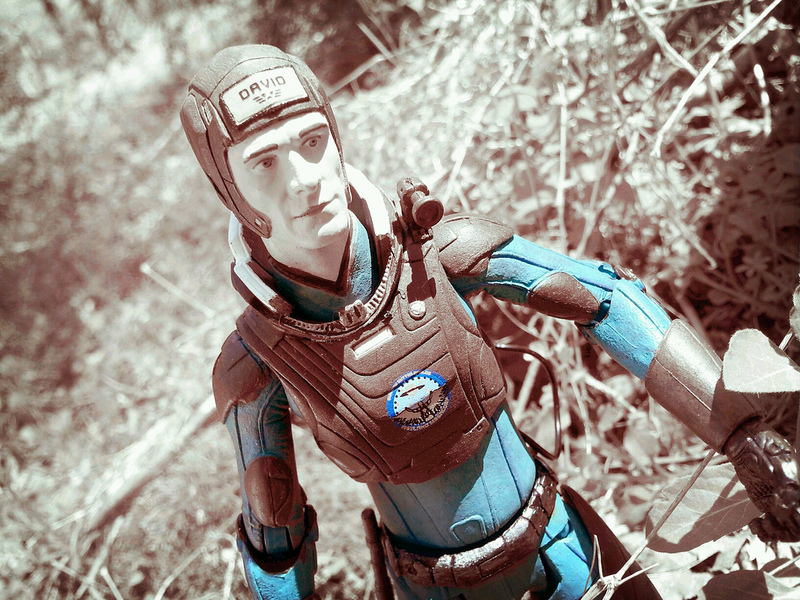 David 8 comes in just under the 7 inch mark, so he'll fit in with the rest of your figures from NECA, Mezco, and Diamond Select. 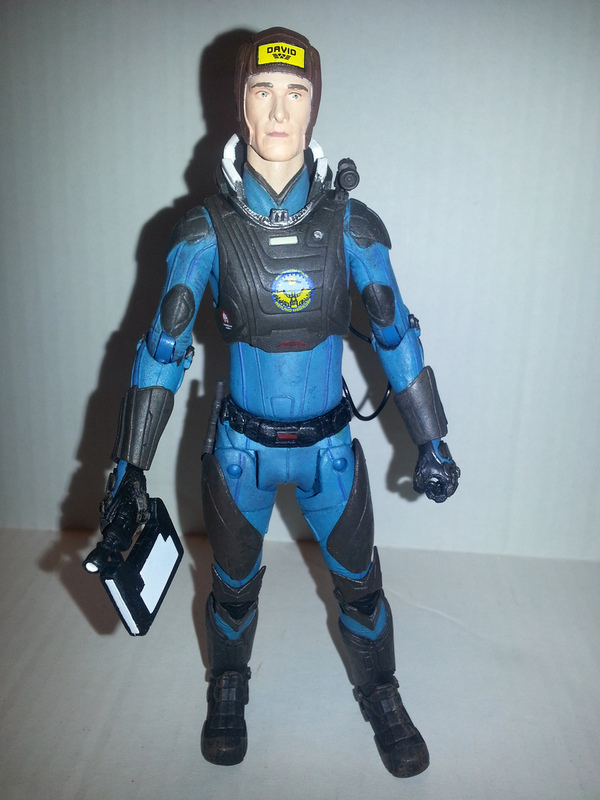 As is typical with NECA's design, David 8 has an extremely realistic appearance to him.  It is a very faithful adaptation of Michael Fassbender's portrayal of David 8 geared up in one of the incredibly cool space suits worn by the crew of the Prometheus. 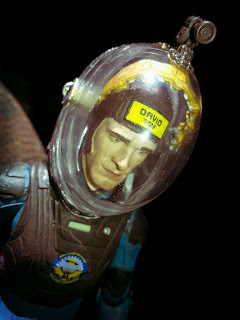 David 8 includes two separate heads, one wearing the hood worn underneath the dome of the suit's helmet and the other depicting a non helmeted David 8 that shows off his T.E. Lawrence inspired hairstyle. David showing off his T.E. Lawrence inspired haircut (actually part of the film, not just a funny comment). Nearly every joint is nicely hidden except those awkward hips. 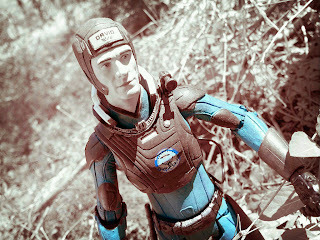 NECA has been improving their articulation by leaps and bounds the past few years and David 8 certainlys shows it, as he is extremely well articulated. He has the following points of articulation: Ball jointed ankles, double hinged knees, swivel thighs, h-hinged hips with a swivel, ball jointed waist, ball jointed abdomen, ball jointed shoulders, ball jointed elbows, forearm swivels, ball jointed wrists, and a ball jointed neck. With that much articulation, it sounds petty to complain about a missing joint but I'm going to do it anyway. Where are his bicep swivels? This is the exact same problem I pointed out when reviewing the Injustice Batman from Mattel's DC Unlimited line. Bicep swivels are a really important joint as the allow the figure's arms to be positioned in front of the body and there absence is always noticed. I do like how the majority of the joints are integrated naturally into the design of the armor, such as being hidden by the edges of gloves or underneath knee and shoulder pads. The only joints I don't like are the H-hips. The movement is fine but the way NECA implements them is extremely ugly (giant pegs showing on the front of the figure) and the figure looks really awkward with the legs spread away from the body. Still, overall it's an impressive effort. While I had some criticisms of the articulation, I can't say that I have any with the sculpt. David 8 is just an exceptionally well sculpted figure that masterfully captures the intricate design of the Prometheus space suits. The various elements of armored plating on the suits look really impressive as the sculpts have a "harder" appearance to them than the body of the suit. 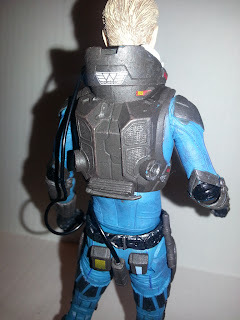 You really have to have the figure in hand to appreciate the gloves, both the plating and joints on the fingers and the texture on the palms, but there are loads of other cool details you'll notice such as the sculpted and separately attached pockets and flashlight hanging off of the belt. 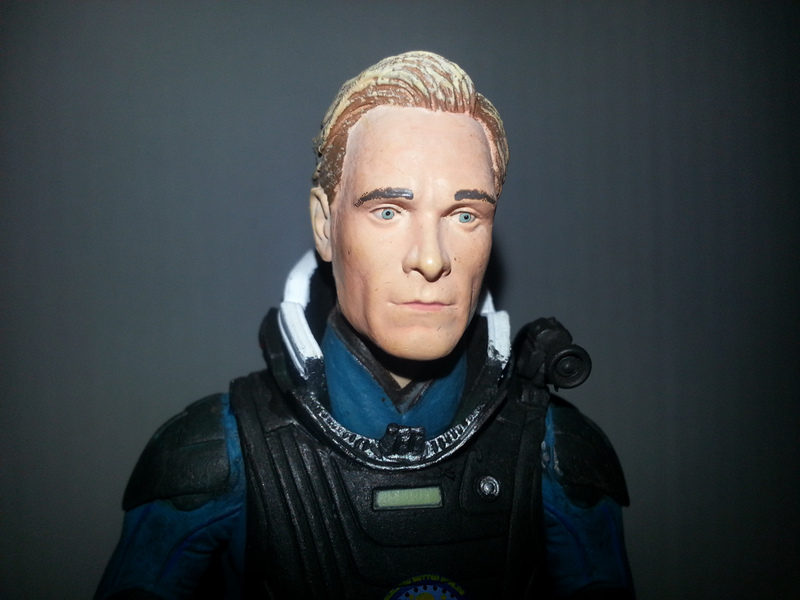 Oh, and the head sculpts are dead on for Michael Fassbender. 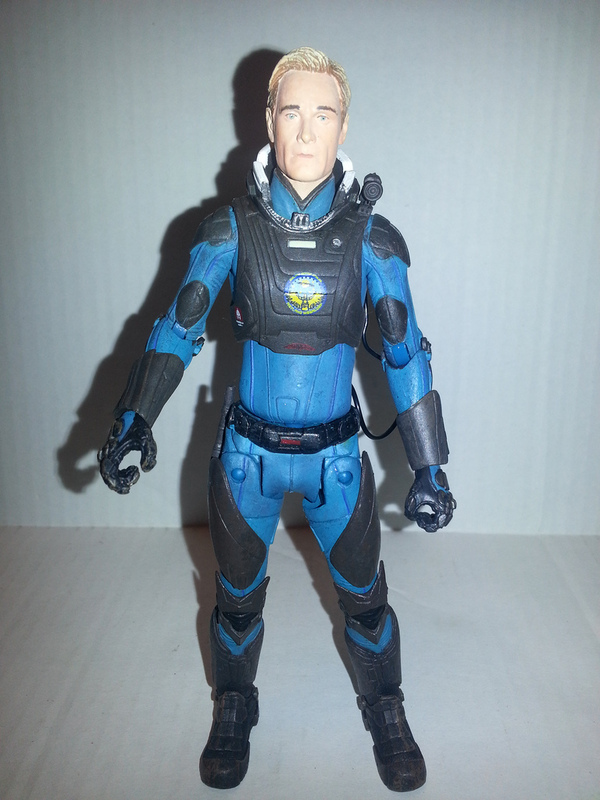 They really capture the look of David 8, although I do prefer the helmeted version. The helmet is a separate piece that slips on over the head and attaches to the suit. Again, when looking at the paint I'm overall impressed. If I had to nitpick, I'd say that the paint on the eyebrows of the non helmeted David head are a bit off, but when I look at the small details, that small element is completely overshadowed. First, the suit overall has a nice look to it. The bluish green body suit has the matte appearance of material while the various armored parts look like they're made of sturdier stuff with a slightly metallic shine. The various emblems painted on the armor are amazing and perfectly clear. There's a Weyland Corp. and a Prometheus logo on the chest and on the back of the suit's neck, and of course there's the "David" name on the hood worn by the helmeted head. Lots of minor details get paint coverage to create a very impressive figure. Prometheus had excellent costume design. As mentioned, David 8 comes with two heads. It's very easy to remove a head from the body and put another one on. While NECA could have tried to sell these as two different figures (or worse, make one of the heads a chase variant) they opted to give consumers the most bang for their buck. Good call! Besides the two heads, David also has the large dome helmet that fits over his suit. While he can wear it over either head (or with no head- Spooky!) it's designed to be worn over the hooded head. One of the elements on David's belt is actually the power source for his mounted camera. There's a flexible plastic cord leading from it to the movable camera on David's left shoulder (not removable, though). The camera has a hinged base and can mount on David's left shoulder when his helmet is off or on top of his helmet when he's wearing the dome. That's called attention to detail! Last, but not least is David's flashlight unit. Ok, maybe it is least. It's a cool accessory with a few paint details, but the sculpt doesn't compare to the rest of the figure. Still, it's a logical accessory, looks good being carried by David, and is far more than most companies would have given us as accessories. The backpack unit and pouches. Like David 8, Barbecue17 can ride a bicycle, read, and shoot a basketball all at the same time. Unlike David 8, however, this usually results in a trip to the hospital. While recovering, Barbecue17 photographs toys and action figures and puts them on his Flickr account.